(Nanowerk News) Researchers funded by the National Institute of Biomedical Imaging and Bioengineering at Tufts University and their collaborators have successfully developed a 3-dimensional (3D) tissue-engineered model of bone marrow that can produce functional human platelets outside the body (ex vivo). A microscopic image of the 3D silk bone marrow structure. 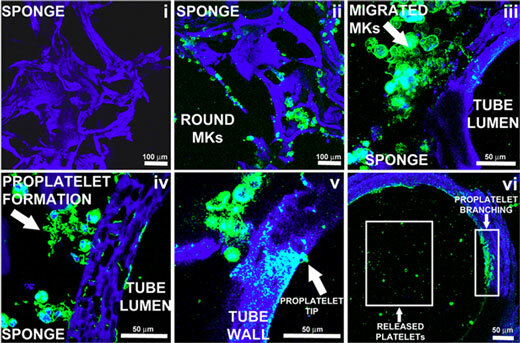 (Image: David Kaplan, Tufts University) The researchers worked to mimic the complex environment where megakaryocytes develop and mature into platelets. This environment includes endothelial cells (the cells lining the inside of blood vessels) and extracellular matrix (ECM) components, which provide structural support and signaling to surrounding cells. David Kaplan, Ph.D., professor and Director of the NIH P41 Resource Center on Tissue Engineering, Alessandra Balduini, M.D., and their collaborators have focused on forming bone marrow models with these components and other growth factors to imitate and support the formation of functional human platelets. Next, endothelial primary cells (EPCs) were grown on one side of the silk scaffold and megakaryocytes were seeded on the other side. (See image below) EPCs are known to secrete growth factors that help megakaryocytes mature.